Apple recently released the predecessor to the ever successful and famous iPad. 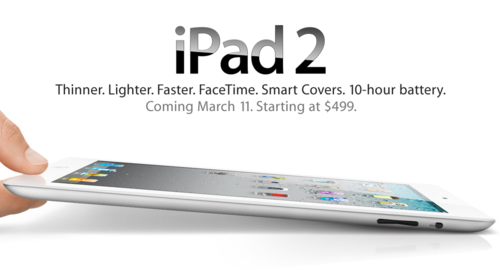 They named it the iPad 2! It's 33% thinner than the original, 15% lighter, much faster since it's now on a dual core processor (the A5). It's got tons of other new features too like the 2 new cameras for FaceTime and HD videos and also the gyroscope in addition to the accelerometer. The iPad 2 is really amazing as I happened to watch the announcement online. I must admit it though that when the first iPad came out, I really wasn't into it. I even mocked its name before. It just wasn't the time for a tablet I guess. However, I really did not expect that in a year's time, it would change the world. It changed the whole computing technology! It even paved the way for copycats. Today, tablets rule the market. The iPad 2 is Apple's frontline for this industry. 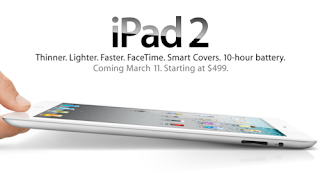 They boldly claimed that 2011 will be the year of the iPad 2. With the already huge app store, brilliant feature-rich product design and some awesome marketing, I'm sure they will be able to achieve this.